Safe Charging: Wall charger use PC fireproof material, provide multiple protections, including: Output short circuit, built in over-current, over-voltage and over-heating protection etc. This USB Wall Charger has undergone 100% burn-in tests, extending the service life and charging more safety. Premium Performance: Input: AC100-240V (U.S. & World Standard), Output: DC 5V/2.1A. wide voltage range matching different safety voltage standards. Dual USB port output allows you to charge with two devices and save your time. Highly Adaptable:This European power adapter applies to France, Italy, Spain,Germany, Israel, Portugal, Poland, Greece, Romania, Holland, Finland, Turkey, Belgium, Cyprus, Norway, Iran, Sweden, Bahrain, Serbia, Yugoslavia, Ukraine, Bosnia Slovenia, Saudi Arabia, and more. 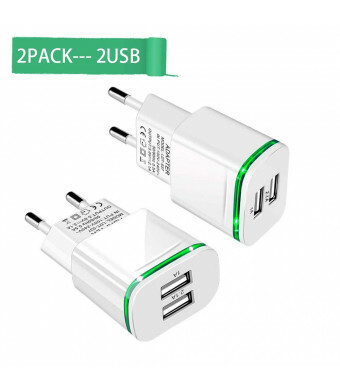 What You Get: 2Pack European Plug Adapters (2-Ports).Within 30 days unconditional refund guarantee, and 12 months warranty.24 hours friendly customer service.We are always here.Add it to your cart now! 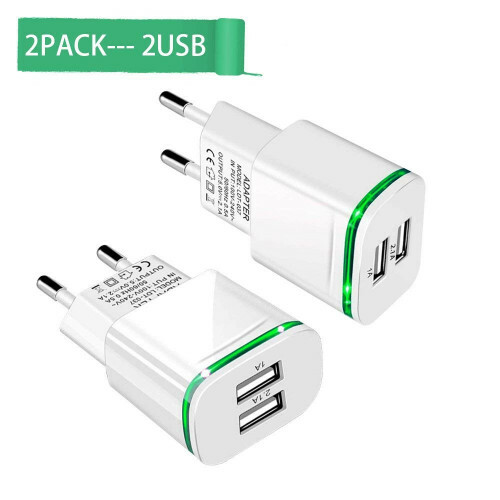 This LED glow wall charger with dual USB ports are a highly durable, ultra compact, universal charger for iphone and Android smartphones and tablets, ideal for travel, home or office. Built-in green led lights makes charging easily done while at night, and it also makes boring charges interesting, cool and romantic. This dual USB power adapter features a 2.1Amp output, which enables to charge your phone or pad simultaneously, at maximum speed. Smart IC Technology:Protection against over charging, over currents, and over heating. Charging stops when battery is full. Saudi Arabia, Bosnia and Herzegovina. 30 days money back guarantee. 1 years warranty for repair or exchange and friendly customer services. NOTE: The LED light won't shut down automatically after devices fully charged, please pull the charger out of the power outlet to turn it off.